• Most of Trump's Day is "Executive Time"
By all evidences, Pittsburgh does not want Donald Trump to visit in the aftermath of this weekend's deadly terrorist attack that left 11 people dead. Jewish leaders told him he is not wanted. Pittsburgh mayor Bill Peduto (D) said that this week is not a good time, as the families of the victims are focused on their loved ones' funerals (which, in accordance with Jewish tradition, are happening very quickly). Their sentiments are undoubtedly prompted by a combination of at least three factors: (1) These folks don't care for Trump anyhow; (2) They hold him responsible, on some level, for what happened (between his rhetoric and his lack of action on guns); and (3) A presidential visit is, pretty much by definition, a "look at me" moment that deflects attention from others, even if those others may be a little more worthy of focus. Of course, Trump does not care about any of this. He relishes an opportunity to be in the limelight, and to look "presidential." Undoubtedly, Rudy Giuliani also shared a few thoughts about how politically useful a tragedy can be. And so, the President and the First Lady will travel to Pennsylvania today "to express the support of the American people and grieve with the Pittsburgh community," according to White House Press Secretary Sarah Huckabee Sanders. It is unclear exactly what the visit will entail, and whether or not he will attempt to visit Tree of Life Synagogue (or even the city of Pittsburgh). Special Counsel Robert Mueller has sent Team Trump a bunch of questions that he would like answers to. And, we learned on Monday, Team Trump (that is, the President's lawyers) have written answers to some of them, which they will deliver after the midterms. But, Trump made clear that he is certainly not going to answer all of them. His exact words, as given on Laura Ingraham's Fox News program, were, "I mean, it's ridiculous that I have to do anything because we didn't do anything. But we will probably do something, yes, where we'll respond to some questions." One wonders about a legal strategy that involves answering "some" questions, as opposed to all of them, or none of them. Normally, a high-powered, high-priced team of lawyers would be given the benefit of the doubt that they know what they are doing, but this particular high-powered, high-priced team has pretty much forfeited that supposition long ago. In a formal court proceeding, a person's refusal to answer questions cannot be used against them, but this is not a formal court proceeding. And so, will it really work to Trump's benefit if Mueller issues his report, and it contains a passage like this? In his written responses, Donald Trump acknowledged that on June 9, 2016, Russian lawyer Natalia Veselnitskaya and several members of the Trump campaign met at Trump Tower. Trump was asked by the special counsel's office if he knew of this meeting in advance. He declined to answer. The President was asked if his campaign was trying to collect information about Hillary Clinton. He declined to answer. He was asked if he attempted to cover up the purposes of the meeting afterward. He declined to answer. Most of Trump's Day is "Executive Time"
Despite the upcoming midterms (or maybe on account of them), Donald Trump spends most of his day upstairs at the White House, rather than in the Oval Office doing his job. According to his schedule, last Tuesday, for example, he spent just three hours in his office meeting with officials and giving them directions—the core business of the president. Instead, he spent 9 hours on "Executive Time," a euphemism for tweeting, watching television, and calling his friends. No recent president has taken so much time off and worked so little on the nation's business. Politico has obtained Trump's schedule for the period of Oct. 22-26, a full work week. Presidents can set their own schedules. George W. Bush was an early bird, and Barack Obama was a night owl. But both spent most of their day in the Oval Office talking to senior officials and working on policy. Trump doesn't do that. If he reads something in the newspaper or sees something on television, he can call an impromptu meeting on the subject, pushing his regularly scheduled work into the background. Donald Trump is not a patient man. This is why he can barely tolerate his presidential briefings more than once or twice a week. It is also why he cannot bear to sit in the White House and let the elections unfold—he feels an urgent, basically primal, need to be in the fray. On top of that, he loves, loves, loves holding rallies. And in fairness to him, who wouldn't love being surrounded by an adoring crowd of 6,000 or 7,000 people, who stomp and whistle and cheer at your every word? A lot of attention is being paid to the 435 House seats and 35 Senate seats up next week. Some attention, albeit a fair bit less, is being paid to the 36 gubernatorial races (but see above), which are also important. But practically zero attention is being paid to the over 6,000 seats in the state legislatures also up next Tuesday. In addition to making many laws that affect people's daily lives, state legislatures make laws concerning redistricting, voter eligibility, abortion, and many other hot-button topics, so they ought to get more attention than they do. 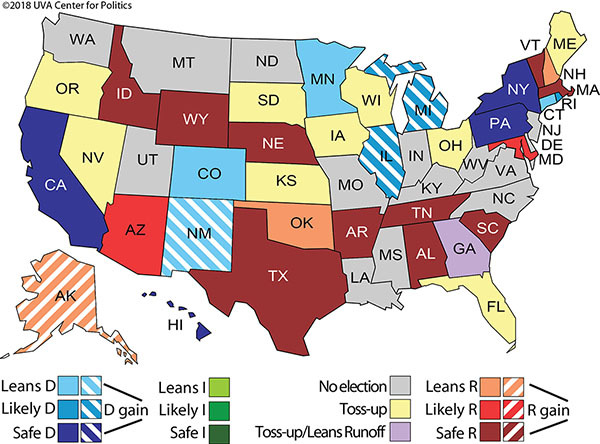 Bloomberg News has a good summary of the state of play for the 99 state chambers. During Barack Obama's tenure as president, the Republicans made massive gains in the state legislatures. When he took over, Republicans controlled 14 states; now they control 31. Democrats now control only 14. The rest are split, except for Nebraska, which has a nonpartisan unicameral legislature. Still, everyone knows that it's controlled by the GOP, so you can really up the Republicans' tally to 32. If the mythical blue wave turns out to be an actual blue wave, that could change. Democrats are targeting 17 state legislative seats that together could flip eight chambers. In three states (Maine, Colorado, and Minnesota), a single net seat could flip an entire chamber. In Florida, a net pickup of five seats could flip the state senate. GOP pooh-bahs in Pennsylvania are not pleased about the new, non-gerrymandered map of congressional and assembly districts that the courts insisted upon. Even absent a blue wave, the map would cost them seats, and with a blue wave it could be a bloodbath. To that end, the Party filed yet another legal challenge, asking the Supreme Court to overturn the new map. SCOTUS said, in so many words: "No." In fact, they refused to even consider the case. There was zero chance that the Court would actually get involved here. First, Pennsylvania Republicans already had their day in court and lost. Several days in several courts, in fact, including the Supreme Court. Second, the current Court is going to do everything it can to avoid looking partisan, at least for a few months, and taking this case does not jibe with that agenda. Third, the Court so thoroughly dislikes the idea of messing around with elections at this late date that they are letting a map that has already been deemed illegal to stand in North Carolina until after the midterms, just to avoid changing horses midstream. Georgia Secretary of State Brian Kemp (R) has gotten himself in the position of overseeing an election where he is on the ballot, running for the highest office in the state. It's remarkable that state law, or else situational ethics, do not cause him to immediately resign his office or recuse himself, but they do not. And, as we and others have noted repeatedly, this is an unusually dubious election, given all the voters who have been deprived, or may be deprived, of their right to vote. On, Monday Jimmy Carter offered up his two cents, penning a letter calling on Kemp to resign immediately. Massachusetts Elizabeth Warren* 56% Geoff Diehl 34% Oct 24 Oct 28 Suffolk U.
Michigan Debbie Stabenow* 52% John James 43% Oct 24 Oct 26 Emerson Coll. New Jersey Bob Menendez* 47% Bob Hugin 42% Oct 24 Oct 26 Emerson Coll. New Mexico Martin Heinrich* 48% Mick Rich 32% Oct 24 Oct 26 Emerson Coll. Rhode Island Sheldon Whitehouse* 55% Robert Flanders 36% Oct 20 Oct 24 Fleming and Assocs. Texas Beto O`Rourke 46% Ted Cruz* 51% Oct 22 Oct 28 Quinnipiac U.